The spiritual science underlying the invocation of Gouri is the welcome of the Deity of Knowledge and the supernatural powers which accompany Sri Ganeshji and to surrender to them with a sense of gratitude. Gouri is invoked to conserve the frequencies of energy generated in the house by the worship of Sri Ganeshji. The worshipper gets the benefit of these frequencies with the worship of Gouri. According to the Scriptures, the time of invocation of Gouri is pre-determined. 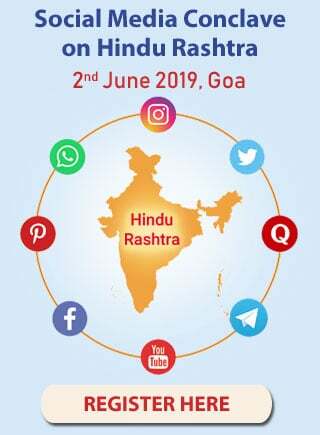 Gouri is to be invoked during that time only. 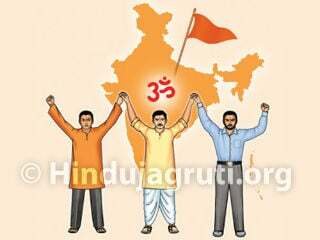 The principle of a specific Deity comes on Earth in higher proportion during a specific time. 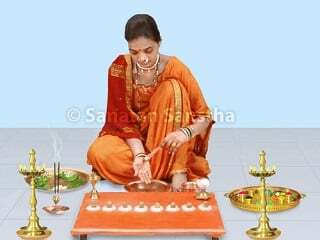 On invocation of the Devi principle in the time pre-determined by the Scriptures, the principle is attracted at the venue of the worship in higher proportion and the family members get its benefit for a longer period. Gouri is installed on the Mul constellation that comes after Rushipanchami. 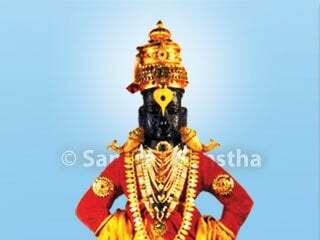 This vrat is observed for three days. 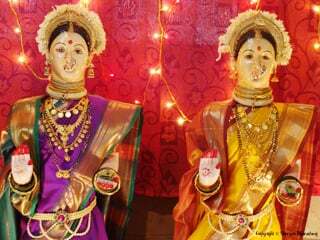 On the first day, when Gouri is invoked, the replicas of the Holy feet of Gouri are drawn on the main gate and everywhere in the house. For this turmeric powder-vermilion or rangoli is used. 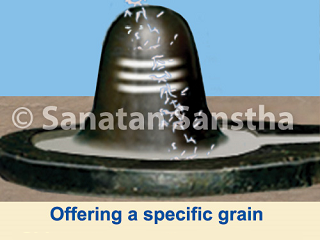 In some regions, Devi is ceremoniously installed on the first Friday of the month of Shravan. On the day of Gouripujan that comes after Sriganeshpujan in the month of Bhadrapad, Jyeshthagouri is ceremoniously installed. 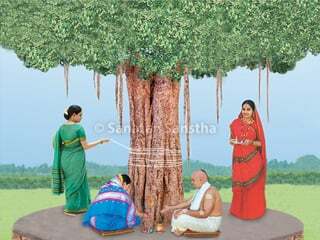 In some regions on the day of Gouri invocation, women worship the Deity of Water, that is, Jaladevata near the source of water. A kalash, that is, a copper pitcher is filled with water and the leaves of mango tree, champak tree etc. are placed in it. Five stones are also put into it. They worship the kalash. This is also called ‘Gangagouri’. On the second day, Gouri is worshipped and offered ‘mahanaivedya’. A flow of Divine principle and Chaitanya in the form of Apa-tattva is attracted in the metal pot of Gouripujan.A. Spirals of Divine principle and Apa-tattva are generated in the metal pot of Gouripujan. A. A spiral of Energy (Shakti) is generated and it moves in active form. B. A flow of Energy (Shakti) is emitted into the environment. C. Particles of Energy spread into the environment. Due to the masks made in the metal pot, the married woman is benefitted of the presence of the Deity. The Sagun form of the Deity was perceived in the masks made in the metal pot. Hence, the Nirgun principle of the Deity is attracted in the metal pot in the Sagun form and the woman who worships it is benefitted.